Joy waits for us in every circumstance. It is seen by those with hungry hearts and observant eyes, able to view the crumbs and corners of each day from God’s perspective. 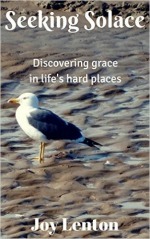 We receive daily grace gifts like manna in the wilderness, soul sustenance and supply. Yet we can so easily miss or overlook their appearing, neglect to take note of God’s goodness toward us. Like a good friend stealing toward us, unnoticed at first, then greeted with delighted enthusiasm, joy also comes to us with sudden softness, appearing unexpectedly to brighten up our days as we welcome it in. Joy is like a garden plant appearing to spring up overnight because we had somehow missed seeing it while it was growing, but now it stands out as something bright and beautiful, suddenly become a bold feast for the eye and a flag of hope to revive a flagging faith. Joy often comes without warning, breaking through the bad with a holy contentment, a comforting warm glow within despite the chill of painful circumstances, the dirge of our daily grind. We are asked to pause, be still and savour its entry, marvel at how joy has the ability to alter our thinking as we keep a conscious reminder of its presence hidden in our midst, hovering on the edge of everything. The poem below is an attempt to describe the ephemeral nature of joy sometimes. Though we have constant access to it, our situations, thoughts and feelings can cause us to have blind-spots to its presence. *Note* – this poem first appeared on my writer friend, Barry Pearman’s ‘Turning the Page’ blog where I was guest posting last year. I’m truly thankful you are here as we draw this series to a close! I’d love to hear how are you seeing and sensing joy in your own life. Feel free to chime in with the comments below. where hope’s embers linger.” Yes! That’s it! You are so creative with your wording, my friend. 🙂 Blessings and hugs to you! I just have to add, Joy, that it wasn’t until I after I hit “publish” on my post this afternoon, that I realized that God had answered that very thought about “cold” which had struck me so deeply through your words this morning! I am so thankful for the ways that God is weaving all of this together in His own way now. You are a blessing from God. when all our hopes are failing. for whom we have been waiting. to spread healing all around. for now and each tomorrow.